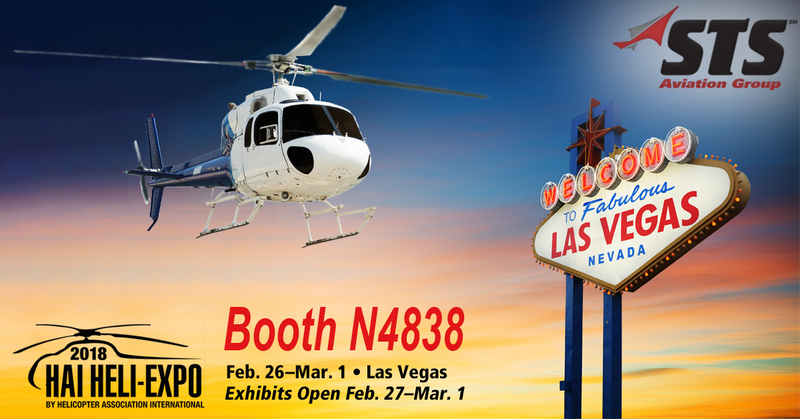 STS Aviation Group Readies for 2018 HAI Heli-Expo in Las Vegas! HAI Heli-Expo is the largest helicopter expo in the world. This dynamic event is where the leaders and professionals within the global helicopter industry gather to build business relationships, network, exhibit their products and services, discuss topics and trends and work together towards solutions. Under the roof of the Las Vegas Convention Center, you can meet with 20,000 domestic and international industry professionals from more than 90 countries take in the exhibits of over 700 companies and get up close looks at 60+ static aircraft displays. You can also sit in on 100+ educational courses, workshops and seminars with topics such as helicopter maintenance management, turbine engine hygiene, rotor blade preventative maintenance and so much more! You also do not want to miss the HAI Heli-Expo Welcome Reception, sponsored by Bell Helicopter on Monday February 26th from 6:00-8:00 pm at Intrigue Nightclub. Everyone is invited! Members of STS Aviation Group, Luis Garcia (Vice President, STS Air-Pro), Chris James (Director of Sales, STS Air-Pro), Brian Wilson (Account Manager, STS Air-Pro) Tim Staples (Sr. Vice President ,STS NDT Services) will all be available to meet with during the conference to discuss any of your company’s hose manufacture / distribution and non-destructive testing and aerospace welding support requirements. “STS Air-Pro has seen a huge increase in hose demand over the last three years”, says Luis Garcia, Vice President of STS Air-Pro. “We attribute this to making the Customer our top priority, providing a quality product and delivering on or before the promise date with fare pricing. We’re small enough to adjust quickly to customer demand but big enough to handle any size project. With a proven track record of providing the highest levels of customer satisfaction, our sales, customer support and AOG response teams provide same day service in the middle of the day or in the dead of night. We work hard to earn your business every single day. Be sure to fly by booth N4838 during the HAI Heli-Expo and meet the STS team. We really look forward to seeing you all in Las Vegas!